Mobile is certainly a buzz word right now and not just in elearning circles. 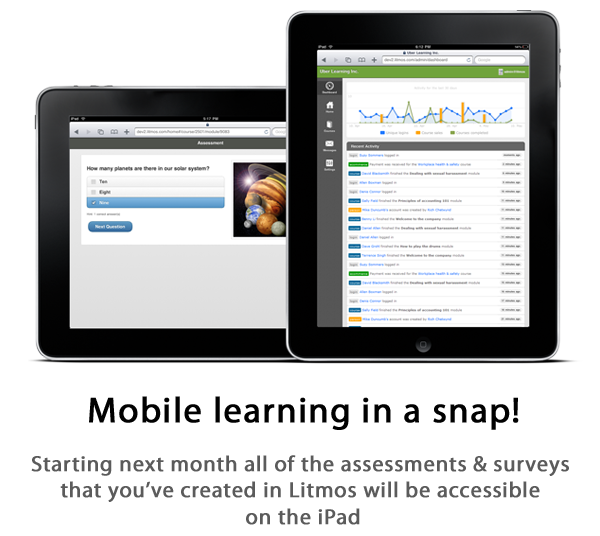 As many of you know, Litmos released one of the first mobile LMS solutions for iPhone, Android and iPad about a year ago. It was a great entry into the mobile space for Litmos and allowed us to start working out what our customers truly wanted out of a mobile learning solution. Currently the mobile version of Litmos enables your learners to watch videos, listen to audio tracks, read news, notes, messages and download documents like PDFs. As of next month we're very excited to announce that mobile access will also include surveys & assessments. We've also added a cool new dashboard for Administrators and Team Leaders which gives you a real-time view on all of the activity happening in your Litmos account. Whether its assessments being completed, emails being sent or courses being sold now you can keep track of all this and more while you're on the move.